In Atlanta, I think we straddle the line between the Gun-Control advocates and the Second Amendment defenders. As a born and raised New Yorker but a self proclaimed "gun-girl" I believe I have the capacity to see both sides. I hear everyone calling for the country to have a real conversation of the issue, but all I see is each side talking amongst themselves. And everyone came away from the conversation a little more knowledgable. Now I'd like to keep it going, if we can. Please define what you mean when you say "Gun Control". If you are against, what part of the definition offends you? Would there be any gun law you might be able to get behind? If you are for stronger gun laws, please share what those laws should be and how they might be enforced. When I am at work and someone tells me they want to buy a gun, they have to fill out a form and show a drivers license and such...then I call for a background check and if all is cleared the gun is sold. On "class III" items it is a very different story. The background check is more intensive, the waiting period is longer and the cost of the gun is higher. Which nobody understands. You can't just walk into ashop and say hey I want a fully automatic rifle and expect to just buy. So now I'm curious, how often are these mass shootings done by class III arms? As far as I know, it's rare. ...then what is really at issue here? A side note: it would be trivially simple to massacre 27 people in, say a mental hospital or a day care or nursery with heroin in well under an hour. A quick injection of a massive dose is all it takes. Hey Gabby. I'm interested in this discussion too. As near as I can see, the anti-gun people keep saying that if we take enough guns away from everybody, not enough guns will be around for anyone to do any harm. There might be some truth to that argument over a long period of time, it seems to me. But, in the meantime, the first people to be disarmed are law abiding citizens. People who have one or two guns to defend themselves and their family from everyday violent criminals. The last people whose guns might go away are violent criminals. In the mean time, how much violent damage is done to increasingly defenseless people who have only baseball bats to defend themselves? It seems to me that the anti-gun side doesn't really understand violent criminals. Once a person resorts to violence, the window for rational discussion is closed. At that point, discussion by well-aimed gunfire or by the threat of such is all there is to stop a violent individual. Violent criminals are afraid of superior violence. They respect that. So how does taking guns away from nice people keep violent people from taking whatever they want from nice people? Another aspect to the conversation that I think anti-gunners miss is that "official gun experts" (police, etc) are not liable for protecting our safety. Their job nowadays is to investigate crime and capture criminals. They have no obligation to prevent violence. So, after you've already been killed by a violent offender, they will professionally investigate your case and pursue the bad guy. Now, wouldn't it make more sense if you were able to shoot the bad guy yourself? Before he killed you and your family? And then the police could take pretty pictures of a dead bad guy instead of a dead innocent victim? It seems to me anti-gunners just haven't considered the self-defense aspects of this stuff. Why didn't DiFi consider the notion that if George Moscone and Harvey Milk had been armed and themselves and had been alert and trained, that they might be alive today and that Dan White might have been in the chalk outline? If they had gone down fighting it's doubtful that White could have delivered the final headshots that ended their lives. Grisly, yes, but we are talking about violence here. I have to conclude that anti-gunners are in denial of the reality of violence in our lives. They want to pretend on some level that nothing bad (highly violent) could happen to them. So go ahead and take the guns away, because nobody needs them really. Just those paranoid nut jobs in the NRA. So maybe all this comes down to how real you feel the threat of violent attack could be to you and your family. If your personal model of reality allows for Random Acts of Violent Insanity (RAVIs), then you probably believe in self-defense by gunfire as a last resort. If you believe that RAVIs are some sort of urban myth or folk lore perpetuated by paranoid people, then perhaps you're more likely to believe in gun control. Hi Gabby, unfortunately I can't read your conversation with your friend, so I don't know what was said. In reality, my position is simple. Most "gun grabbers" want to pretend that "eliminating" guns will eliminate mass murder, and they argue for elimination of "assault rifles" or "high capacity magazines" or whatever is the flavor of the day. They may actually believe it, but it's not true in the least. 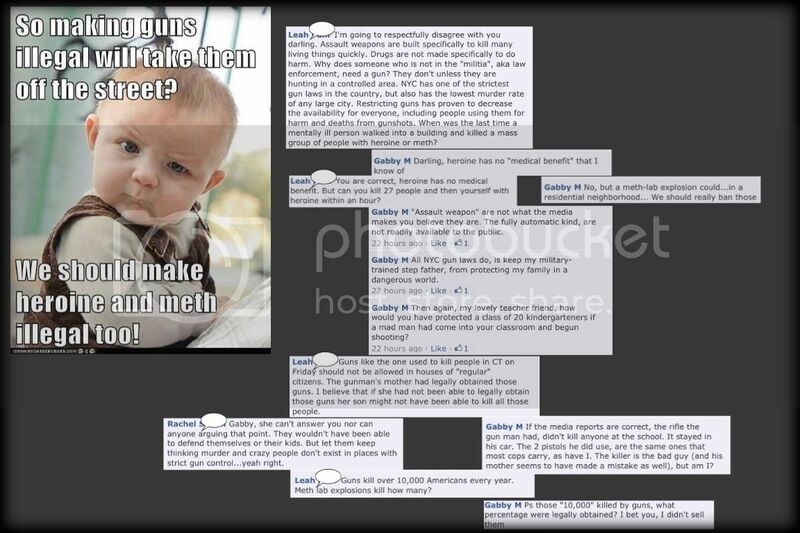 Your baby poster is exactly right--making something illegal will NEVER eliminate the problem. There is a saying that a bad guy with a gun can be stopped by a good guy with a gun. Pretending that "gun free zones" are actually safer than "gun welcome" zones (like my house) is foolhardy at best. They become a killing zone for some maniac who knows they won't be stopped by a good guy with a gun. These cowards typically kill themselves when the police finally show up, because now the odds have been evened. In reality, people are like sheep--they don't want to believe evil exists, and so they wish to legislate it out of existence. Unfortunately, evil (like a wolf to a herd of sheep) doesn't listen to or care about laws, all it cares about is what it wants. That's why there are sheepdogs, who put themselves in the way of the evil intentions and protect the sheep, and will give their life to protect the sheep if needed.